If you've lost a tooth or need to have one extracted, you have to decide how to replace it. Of all the options available none can match both the lifelikeness and function of a dental implant. A dental implant is a prosthetic (false) tooth that mimics the root of a natural tooth. Once that implant root form fuses to the surrounding bone, we attach the crown, which is the part of the tooth you can see. While other replacement options like bridges or dentures can restore the lifelikeness of the tooth crown, they don't replace the root. An implant's titanium post can: using a minor surgical procedure we imbed the post into the bone. Because bone cells have a natural affinity with titanium, they will grow around and adhere to the post over a few weeks after surgery. This further adds strength to the implant's hold in the bone. Although the attachment isn't exactly like natural teeth, it can maintain this hold for many years. And because it encourages bone growth, a dental implant will help minimize bone loss, a natural consequence of losing teeth. Other replacement options can't do that. Of course, implants are more costly than other restorations. 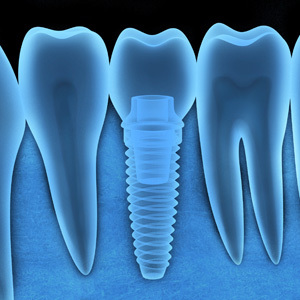 With an attached crown, an implant can replace any number of teeth. But if you have extensive tooth loss, bridges or dentures would be more cost-effective selections. But even then, implants could still play a role. We can strategically place a small number of implants as supports for a bridge or even a removable denture. Not only will the implants better secure their attachment, they'll also stimulate bone growth. Is a dental implant the right choice for you? Visit us for a complete examination and evaluation. Afterward we can discuss your options and whether this phenomenal tooth restoration method could help restore your smile.